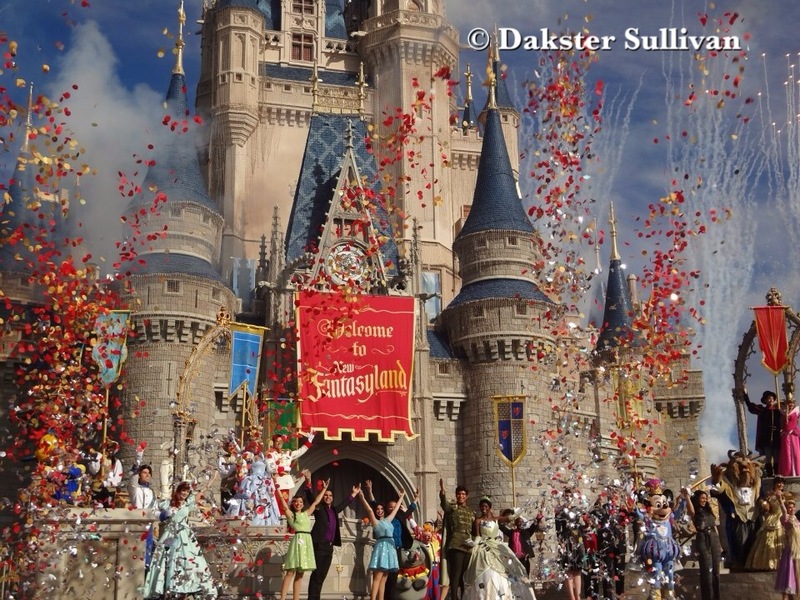 With a press pass around my neck and my family in tow, I was given a front row seat to everything that happened during the three-day grand opening of the New Fantasyland at Disney World in Orlando, Florida. The new Fantasyland is full of over ten new acres of Disney fun. 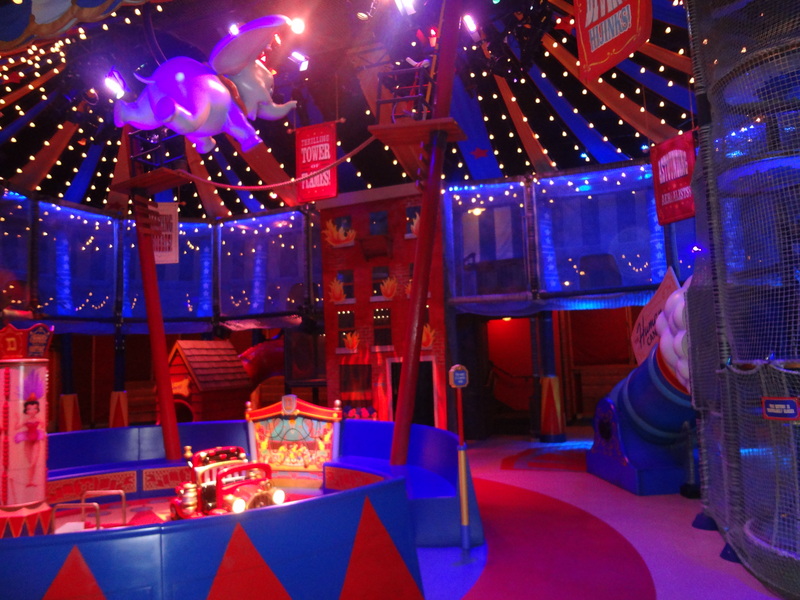 The expansion brings to life a new circus themed attraction area and two new castles and, inside of each, there is something new for fans of all ages to check out. I will be breaking my experience up into four separate posts, including an inside look at what it means (and takes) to wear a press badge at an event of this magnitude. Let’s get started with a look inside the largest expansion in the history of the Magic Kingdom park! Each of the four new areas includes something special for guests to experience. The Little Mermaid’s castle is actually a ride, Belle’s cottage is a story-time experience, and Beast’s castle is a unique dining experience I wouldn’t miss for the world. Storybook Circus, the area formerly known as Toontown, has a unique “Big Top” merchandise experience, complete with popcorn pin trading and a queue-less double Dumbo attraction (say that five times fast). Now instead of only one Dumbo attraction, we have two! This means twice as much Dumbo for the fans of the high flying elephant and his friend Timothy Mouse. 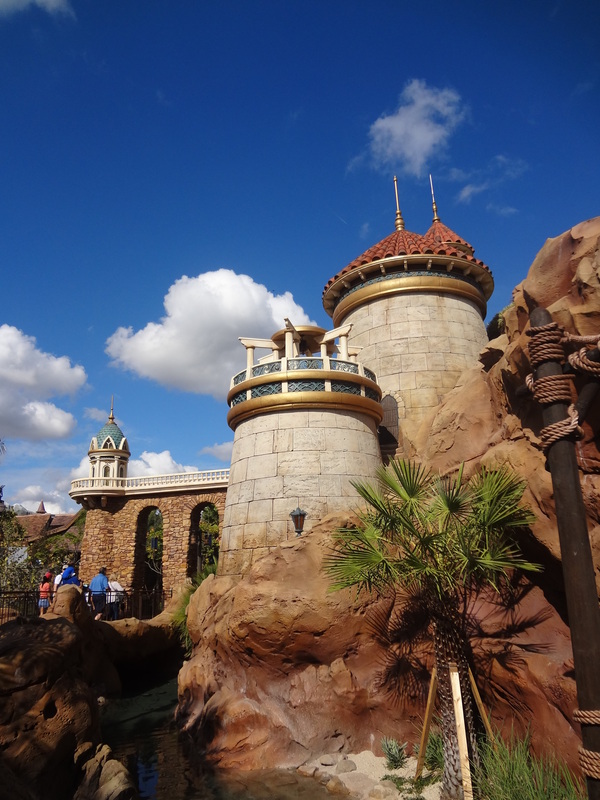 The Voyage of the Little Mermaid is hidden inside of Prince Eric’s castle. The queue line is beautifully done and includes a very special hidden Mickey. One catch…the only time you will get to see it, is at high noon on Mickey’s birthday, November 18th. That alone shows the dedication and love the engineers put into this ride, because in order to accomplish this feat, they had to do some serious calculations and designing around the sun and its position in the sky to make it happen. The ride vehicles are similar to the Haunted Mansion, but with a shell like design. Like all rides based on a movie, this is the abridged edition of the story and I’m happy to see that all my favorite scenes are included. The largest scene in the ride is, of course, the Under the Sea number and houses 128 of the 183 total animatronics in the ride. My husband was impressed with Ursula, who appeared to be the largest of the characters at over 7 feet fall and 12 feet wide. The biggest reactions I could see came in the Under the Sea scene. The room is so big, you need to take a second ride through just to see it all. The music and party-like atmosphere in the room had my son and I dancing in our clam shell. I think the coolest part of the ride was how much detail was put into each scene to make you really feel like you had jumped into the movie. Beauty and the Beast was the first Disney movie I can remember seeing in theaters (did I just age myself?) and I’ve been in love with “a tale as old as time” ever since. With that said, it makes sense that Belle’s cottage would be one of my favorite spots in all of new Fantasyland. There are three very special aspects to this house for me. 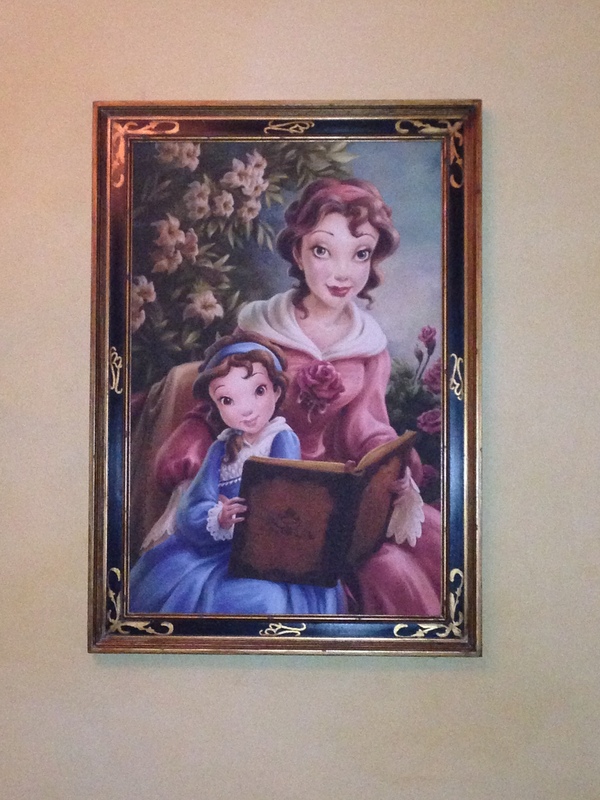 The first is the portrait of Belle and her mother. You never see or hear mention of Belle’s mother in the movie and it was nice to see her included in this attraction. The second is a small detail in the cottage that is easily missed if you don’t know the story well. If you pay close attention, you can see the book that Belle was reading at the fountain with the sheep and the page is even ripped where the furry creature took a bite. The last thing that makes this attraction a must see is the mirror that Beast gave to Maurice as a quicker means of getting to the castle. The mirror sits on the wall and, to the average person, looks like a very average (but beautiful) full length mirror. After everyone says the magic words, the mirror transforms and takes up most of the wall it hangs on and becomes an entrance way into the castle. As hard as I looked to see how they did it, I’m still flummoxed at how the effect is done. Once inside the castle, you get to meet Madam Wardrobe. 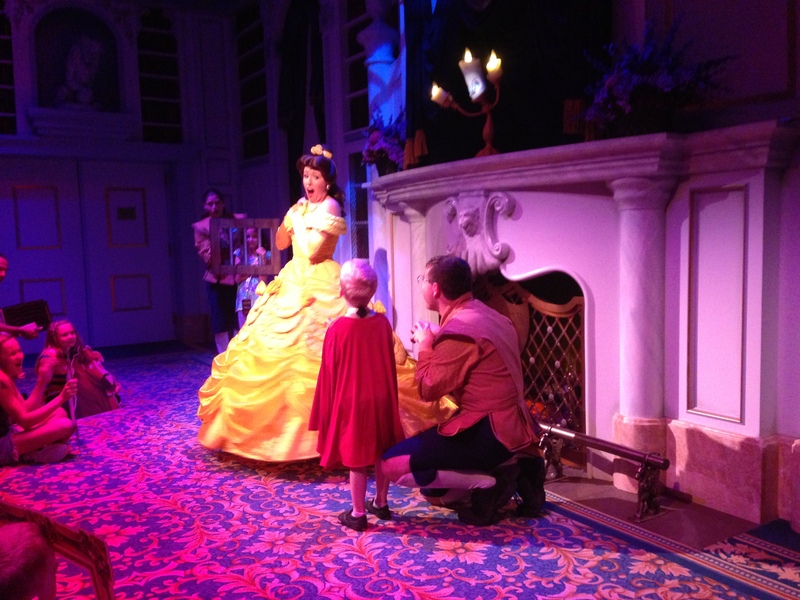 Along with the castle workers, Madam Wardrobe helps get everyone ready to tell the story of how Belle and Beast met. Some of the parts I could tell are catered to younger children (such as the Beast) and some more for the taller participants (knights). Once everyone who wants a part, has received one, everyone is taken into the castle library, where you get to meet Lumiere, the most advanced animatronic on Disney property. While you wait for Belle to arrive, take a look around that over 12,000 “books” surrounding you. The beauty of the room should be taken in and enjoyed, just as much as the experience itself. Disney Photopass is on hand to take pictures during the entire experience. The photos range from $15 and up, but due to the lighting in the room, their cameras might be better suited for the job than the typical point and shoot guest camera. The experience in the room takes around 20 minutes, but that doesn’t include the time you spend in the cottage waiting or the time you spend with Madam Wardrobe getting your story-time attire. Continuing with a tale as old as time, Beast’s castle is absolutely amazing. When I first heard that it was going to be included in the Fantasyland expansion, in my dreams, I wanted to see rooms like the West Wing and the Ballroom fleshed out in all their glory. I wasn’t prepared for it to be restaurant (and quick service during the day at that), but I’m happy with it. The details from the golions (hybrid goat and lion) outside, to the talking knights in shinning armor, to the twelve foot chandeliers in the ballroom are all amazing. The rose itself looks like something plucked right out of the movie and has a very animated look to it. 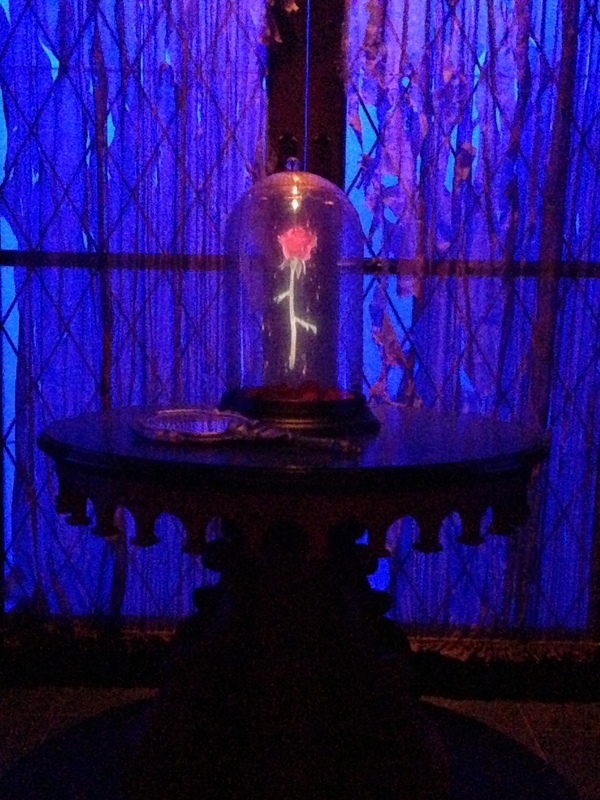 I overheard a cast member say that every so often, a rose petal will fall from it. In one of the other rooms, a giant music box of Belle and Beast rotates on a platform with seating surrounding it. One of the things I wasn’t expecting in the ballroom was the falling snow in the windows. My seven-year old son’s first reaction to this was, “It’s fake!” to which I had to explain to him that it was an illusion and a beautiful one at that. During the day, the restaurant is quick service with kiosks where you can order and pay without any cast member interaction, as well as traditional cast member manned stations at which to order. Food is brought to your table in a very “be our guest” way and the entire experience is one that I would not miss when visiting the park. At night, the restaurant transforms into a sit down dining experience. Reservations can be made up to 180 days in advance and are highly recommended, as some nights they will be so busy, it will be the only way you can get in. I’ve already been trying to get in for my birthday in April and they are completely booked! Another neat dining experience can be found at Gaston’s Tavern. This is more of a quick service snack location than a full service restaurant. It’s here that you will find La Fou’s Brew, a frozen apple cider drink with a mango foam topping. Most agree that this is their attempt to win over butterbeer fans, but after experiencing this drink for myself, Universal has nothing to worry about. The recipe is still being tweaked though, so what I tasted might not be what you taste on your visit. Moving on to Storybook Circus, we get to see the first double Dumbo experience! Any fan of the Disney parks knows that Dumbo has one of the longest lines on average. Thanks to the new queue-lounge, there is no more waiting outside in the stuffy Florida weather. Now, guests are welcomed to visit the queue-lounge, where instead of standing in line with antsy children, guests are given a pager and welcomed into a wonderfully themed, air-conditioned playground for their children to visit and parents to take a seat and relax. My son really enjoys this aspect of the New Fantasyland and it’s a nice place to go and relax when you need a break from standing. If your child doesn’t want to ride, but you still want to check out the playground, no worries. You still have to take a pager, but when it goes off, just let the attendant know your child wants to stay and play a little longer. One thing you are sure to notice, besides the giant towers flanking the entrance to New Fantasyland, is the construction that is still going on in the center of it all. 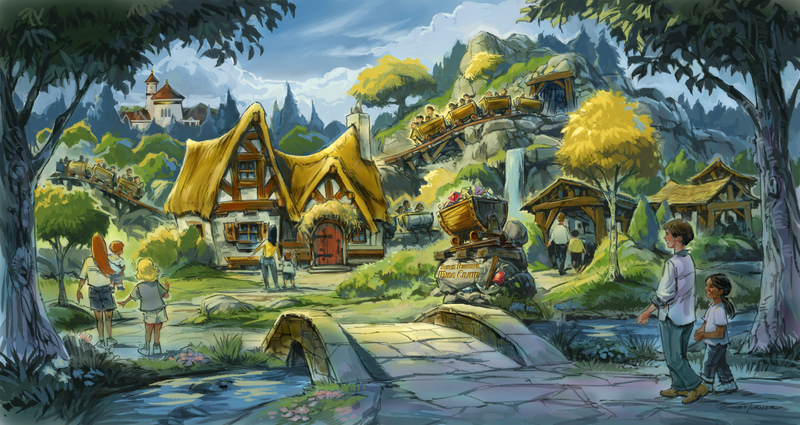 Set to open in early 2014, the Seven Dwarfs mine will be a new and unique coaster with a family thrill level of Thunder Mountain. The mine carts will swing through the ride independently while guests are taken on a journey into Snow White’s world. You can already see some of the construction on the lift section of the ride and there is a special “peep hole” in one of the walls for guests to take a closer look at what is going on inside. This is the first time Disney has placed a peep hole of sorts on a construction project wall and from what I can tell, the guests are enjoying it. Of course, no Disney area would be complete without merchandising shops and New Fantasyland has a couple of those. They have everything from artwork to home decor to toys. I would recommend you take advantage of the free package pickup option when purchasing your souvenirs. After you’re done paying, your souvenirs are taken to the front of the park and wait there until you are already to leave. If you are staying at a Disney hotel, you also have the option to send your items directly to your hotel. If you plan on visiting the resort for a few days and are on a tight budget, take into consideration the kinds of things you want to do and take home with you when planning your vacation. Souvenirs can range from a few dollars (key chains) to way past five figures (original artwork). Snacks and meals can be between $5 and $50 depending on where you go and what the experience is. Tip: Any kind of character dining is going to be more expensive than a table service without furry friends walking around. When deciding on a hotel, check out special deals through various hotel sites, such as Expedia to make sure you are getting the best deal possible (and if you are a AAA member or a Florida Resident, you can get special discounts as well). To cut down on the cost some more, look for one of Disney’s good neighbor hotels. These properties are not owned or operated by Disney, but are still close to the parks and offer transportation to and from the attractions. Currently, Disney tickets are $89 for adults and $83 for children aged three to nine-years-old. If you are looking to cut costs and you plan to stay more than one day, look into getting a multi-day park ticket. The tickets get cheaper with each additional day you stay. You can cut some costs while in the park by bringing your own food. Some friends I know will pack snacks and lunches for everyone in the group and it saves them a bundle. As always, Disney does an amazing job of putting on a show for their guests and this area is no exception to the rule. Take your time when walking through to notice the details you might otherwise miss when running from attraction to attraction. Even taking the Fastpass line through an attraction makes you miss some of the interesting details and beautiful craftsmanship the creators and builders took in assembling the attraction.